Copenhagen’s waste-to-energy plant becomes an urban landmark in a green spirit. Waste disposal is often considered to be just as polluting as wastes themselves in today’s cities, but Copenhagen’s Amager Resource Centre proves this is not always true. The building produces only environmentally compatible wastes, emitting water vapour instead of hazardous fumes. Its location is an important factor: a place where numerous abandoned factories have been converted for new uses and reinvented as sports facilities. The whole area has become a sort of world capital of extreme sports, with facilities such as CCP, Copenhagen Cable Park, a water-skiing centre, a go-kart centre and a free-climbing gym. And so the waste-to-energy plant had to be designed so that it would not detract from the attractions of the area, but add to them. 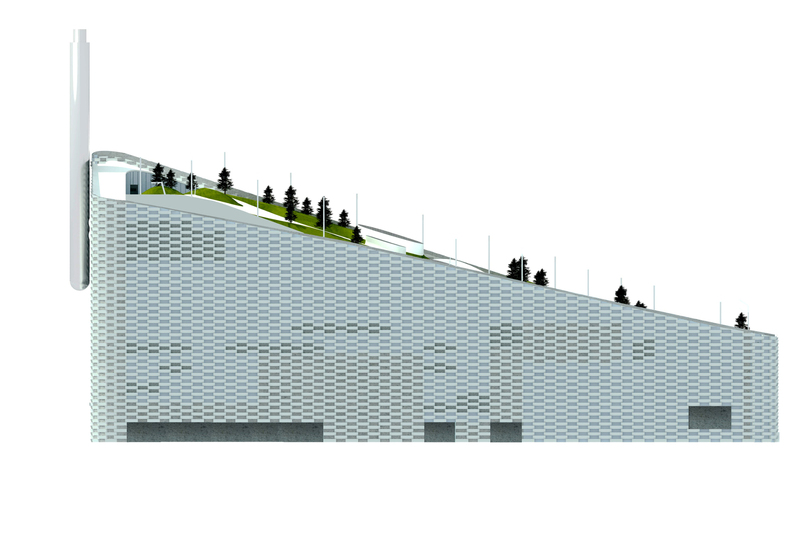 For this reason, in view of the building’s height, BIG came up with the idea of opening a ski hill on its roof, with runs ranging from easy to difficult to attract skiers of all levels. One of the most important problems to be solved on the ski hill was planting species that would withstand both the heat released by the building and the winter snows. The artificial grass was chosen in the colour most similar to a real lawn, so that it would be in line with skiers’ expectations and improve the view when there is no snow. The building’s outer wrapper consists of a conspicuous series of flowerbeds to make it look as much like a mountain as possible, so that even the people who work there feel as though they are in a garden. And, last but not least, a bizarre device “models” the vapour coming out of the stack to create entertaining smoke rings in the sky, denying the conventional image of a waste-to-energy plant.